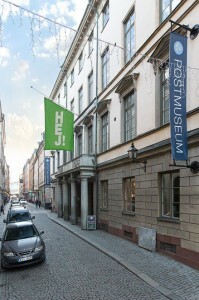 Postmuseum is centrally located in Gamla stan (the Old Town in Stockholm) near the underground station. The museum is housed in the oldest building in the Swedish postal organisation, dating back to the 17th century. It was purchased by the Post Office in 1720, and until 1869 housed Stockholm’s only post office. The museum was opened in 1906 and is owned by PostNord.